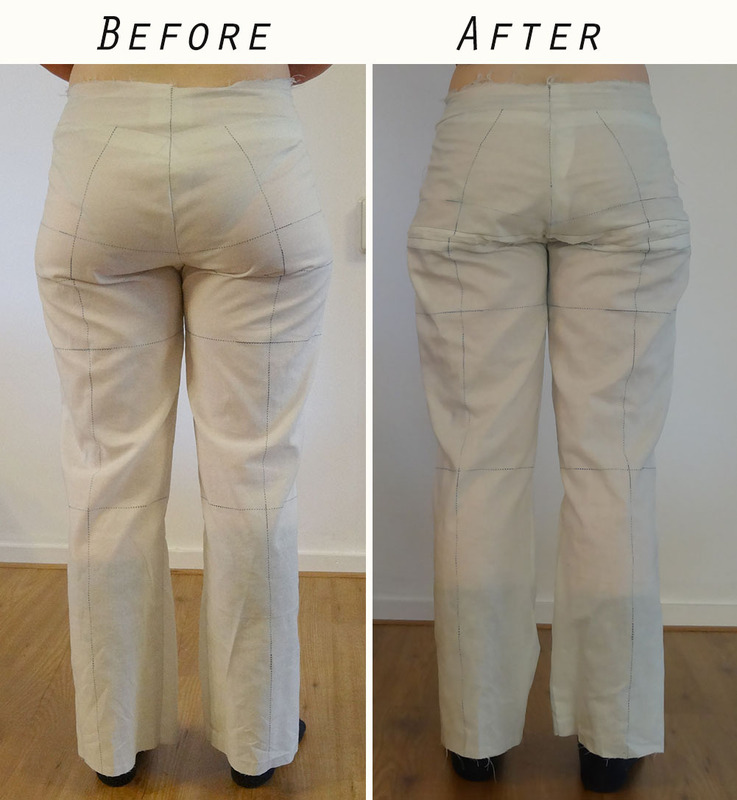 First I’ll show you some changes I made to muslin 3 to improve the fit. At the front I pinned out a horizontal dart and added some fabric to finally fix that wavy side seam (this latter part is better visible in the side view of the muslin). The change I made to the paper pattern to add that extra room to the front is possibly different from how you think it was done so I took some pictures. I chose not to add this extra space by adding onto the side seam because that most likely would have changed the length of the front side seam and then it wouldn’t have been the same length anymore as the back side seam. Instead I made a vertical cut in my pattern and created a lot of hinge points at the side seam. In the muslin I measured at several point how much room I had to add. The hinge points made it possible to curve the original side seam to mimic what I had done in the muslin. 1. Slice in the pattern as you did in the muslin. 2. Create hinge points, I accidently cut some of those too close so they teared… 3. Tape a piece of tracing paper underneath the pattern and shape side seam to add additional room to pattern. At the back I struggled a bit and ended up adding another wedge across. Not sure whether that was really necessary… In the end I decided that the way I had taken out the extra space I had taken out at the yoke wasn’t right and created the weird shaping so for muslin 4 I redrafted this curve in the pattern. Then onto muslin 4. I didn’t have enough fabric left to make it full length so I made it as long as I could with the fabric I had left over from muslin 1 and 2. For this muslin I redrew the back seam because I needed to fix the problems I had created by taking out all of the gaping I had at the center back of the yoke. In the muslin you can see that I am now planning to remove this excess by pinning it out as if they are back darts. This will create some shaping in the yoke pieces and I think this should get rid of the gaping. I also realised that the curve I had at center back wasn’t deep enough to accomodate my curves so I changed it as shown in the picture on the left. Perhaps I’ll have to scoop it out yet a little bit more. 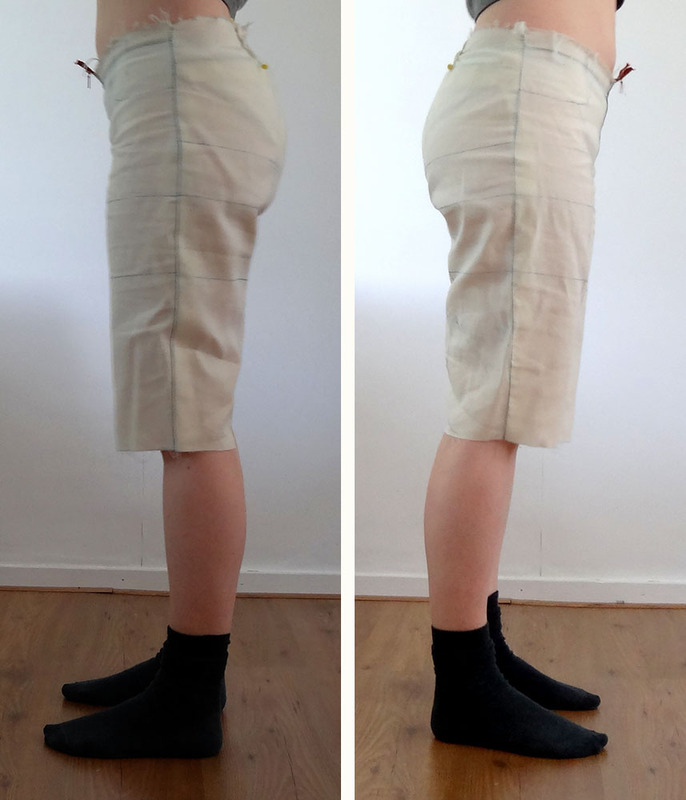 In muslin 3 I felt that after I straightened the side seam it was still located a bit too much towards the front of the trousers so I moved it back by 1 cm in the pattern. This was done by making a vertical slice in both front and back pattern pieces. The front piece was taped to some extra tracing paper adding an extra cm. The back was overlapped to take out 1 cm. Don’t forget to also make this change to the yoke piece! Still a couple of wrinkels at the crotch, but not too bad. The top of the trousers aren’t straight so I’ll have to change that. I think moving the side seam backwards is an improvement. Side seam is much straighter. Top front is a bit lower than the back. 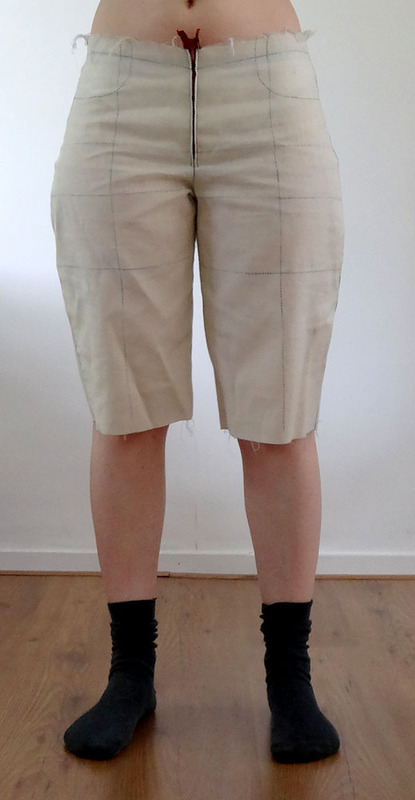 Since jeans are usually supposed to fit quite tight when you put them on I think I’ll make them a bit more fitted at the side- and inseam because the muslin is a bit loose right now and I think they will end up too loose when sewn in a stretch denim. I’m afraid I’ll have to make at least 1 more muslin… Can you believe I am already dreaming of all the easy no fuss tops I’m going to make after I finally finish these jeans? Do you ever get started enthusiastically on a project and then suddenly lose steam? That’s what happened with my muslin process. I was a bit tired and didn’t have much time so not much progress was made and now I have to motivate myself to get back to it. I have finished muslin 4 though and I think I’m really close to getting a good fit. I’ll probably write about it after the weekend. Now I want to show you another part of the sewing process, collecting all the materials and testing out different techniques before using them on the actual garment. Also important: a supply of fresh denim needles! 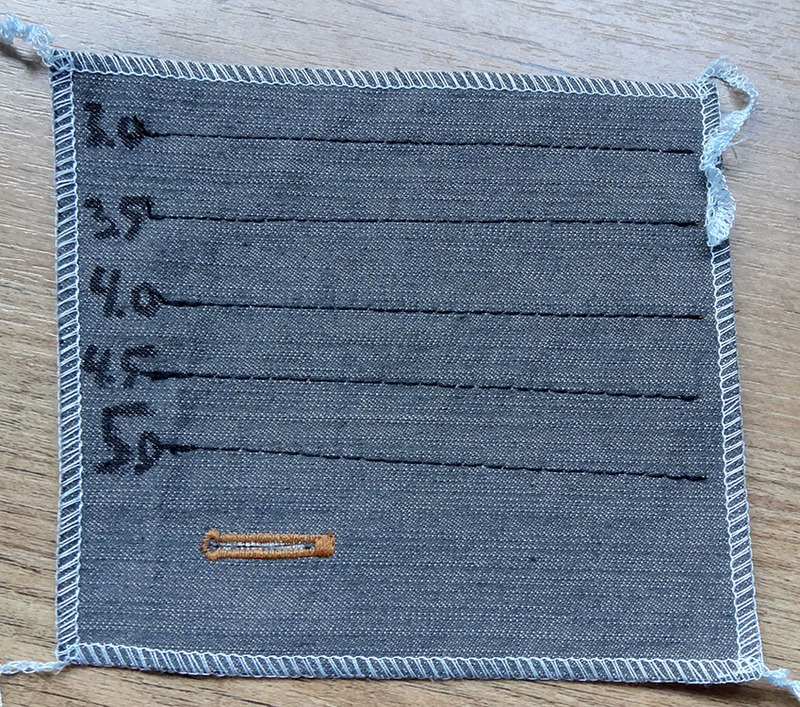 I already bought some denim and matching thread for this project a while ago. All my RTW jeans are blue so I thought it would be fun to use a different colour for this pair and chose grey. I like how the fabric looks and feels, but it is quite lightweight so probably more suitable to wear in summer than winter (so I’d better hurry up making these!). In Angela Wolff’s Craftsy class she shows how to distress denim with sandpaper to get that worn look that most RTW jeans have. I wasn’t really sure how well that would work on my fabric so I tested it and it’s not a success. It makes the fabric fuzzy which doesn’t look very pretty so for this pair I’ll give the distressing part a miss. I’ll have to try it on something else though! 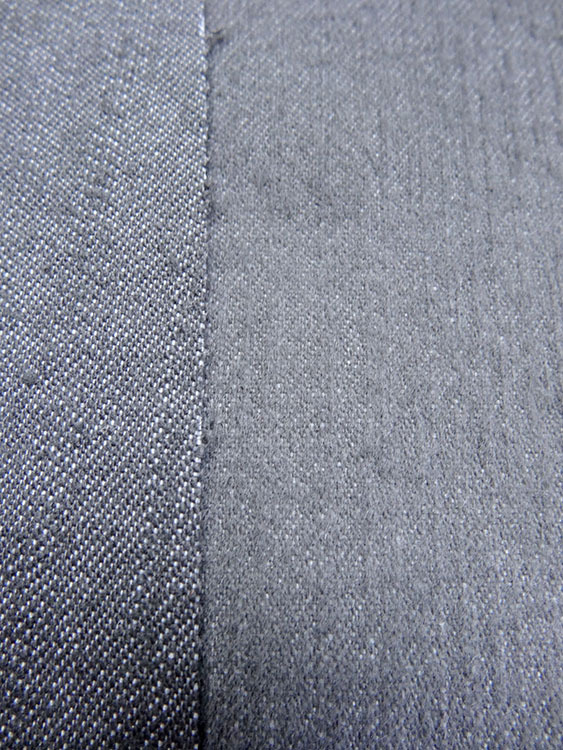 Fabric on the left is not distressed, fabric on the right was distressed with sandpaper. It’s turned a bit fuzzy. 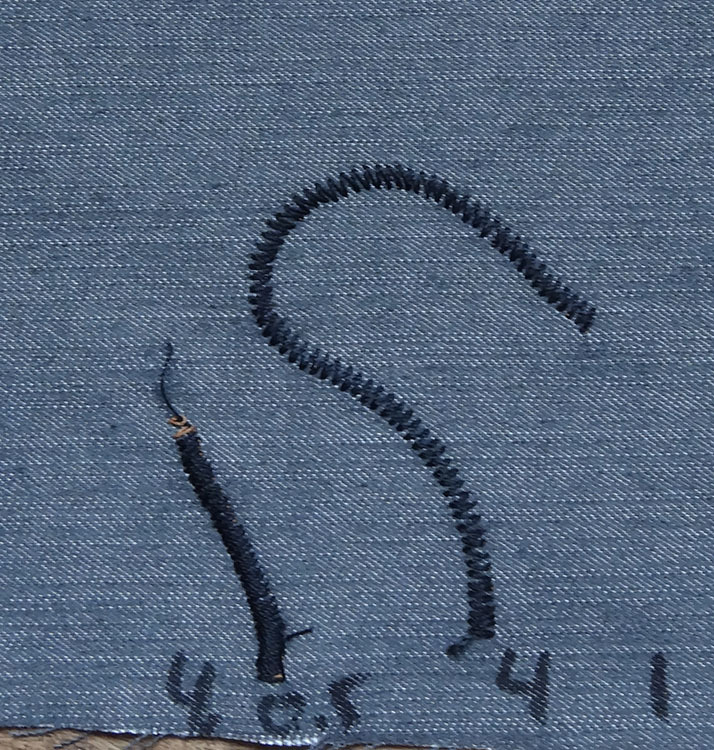 I my opinion topstitching in contrasting thread is one of the scary parts of sewing jeans. It is so visible and if it isn’t done right it can really brand your make as homemade. For my jeans I bought two colours of Coats Epic 40 thread to try out. Black and a brown that is really close to black. First I tried which stitch length would look best and decided on 4.0. 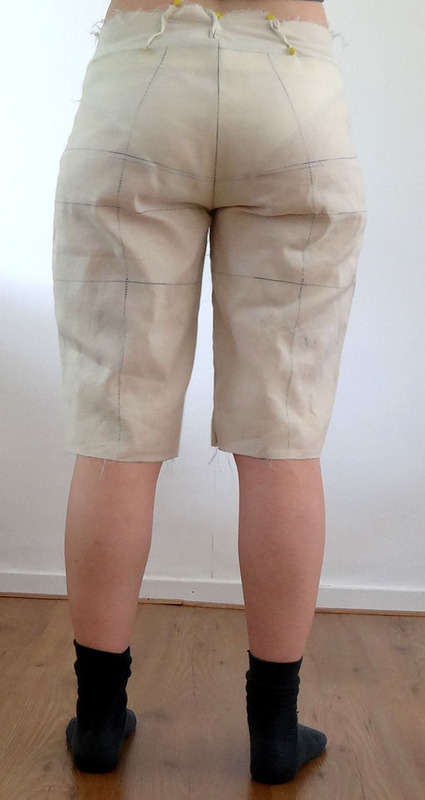 I also tried some stitches to use on the back pocket embroidery (another scary part…). 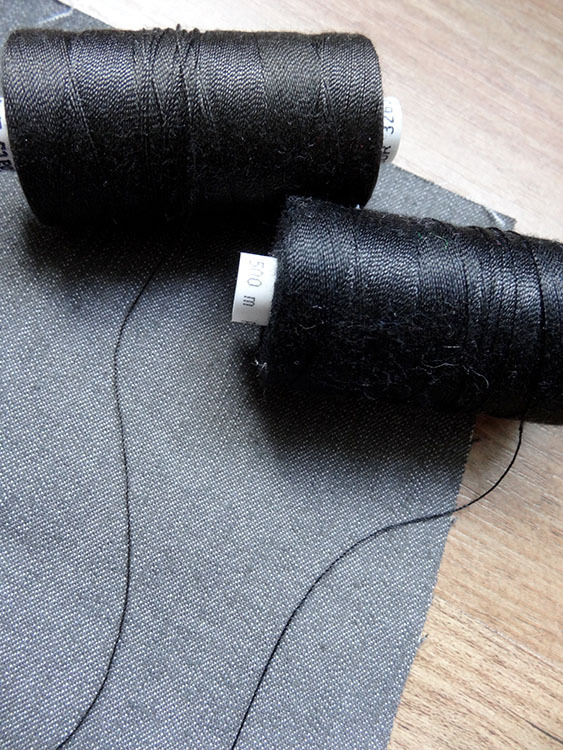 I used the black thread for my samples but I think in the end I prefer the brownish thread over the black one because it is a little more subtle. I’ll have to practise a bit more though to get my double rows of topstitching consistent before I attempt this on the actual jeans. I also tried a keyhole buttonhole. In bag making one trick to make your bag look professional is to throw some metal hardware at it and I think this might be true for jeans as well. 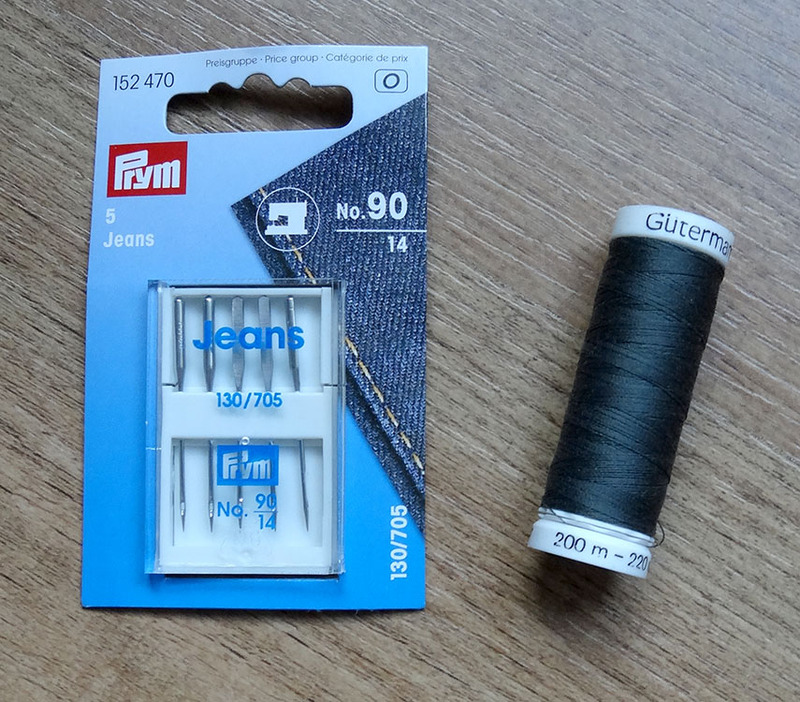 I bought some metal rivets and jeans buttons that I can apply with my Prym pliers. 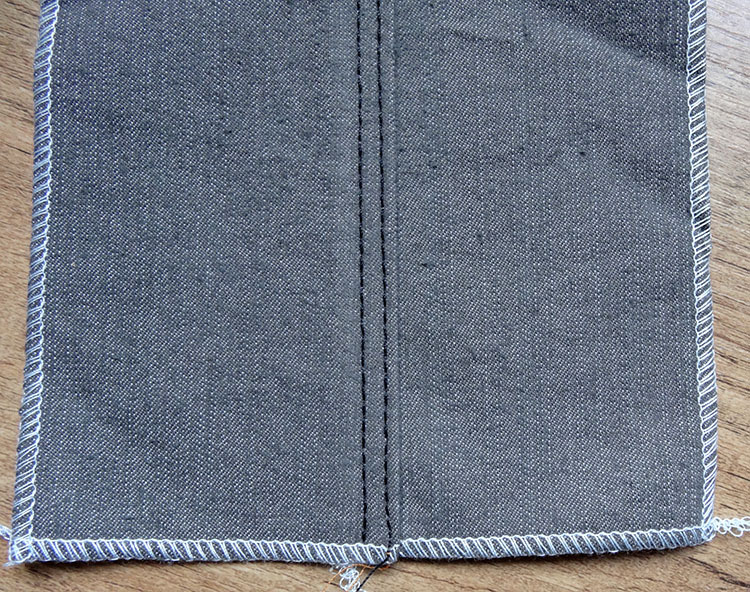 Rivets are typically used in jeans to reinforce pocket corners. I got enough of both in each packet that I could try them out to see how well they behave when I apply them. It worked surprisingly well. It also made me realise that I have to think how I want the button oriented before I put it into the fabric. I think my jeans will feature at least a couple of rivets. I am not yet ready to get started on my jeans because I still need to perfect the fit but I think I do have everything I need to finish this pair. I’ve also already made some design decisions, like which thread to use for the topstitching and what stitch length to use. 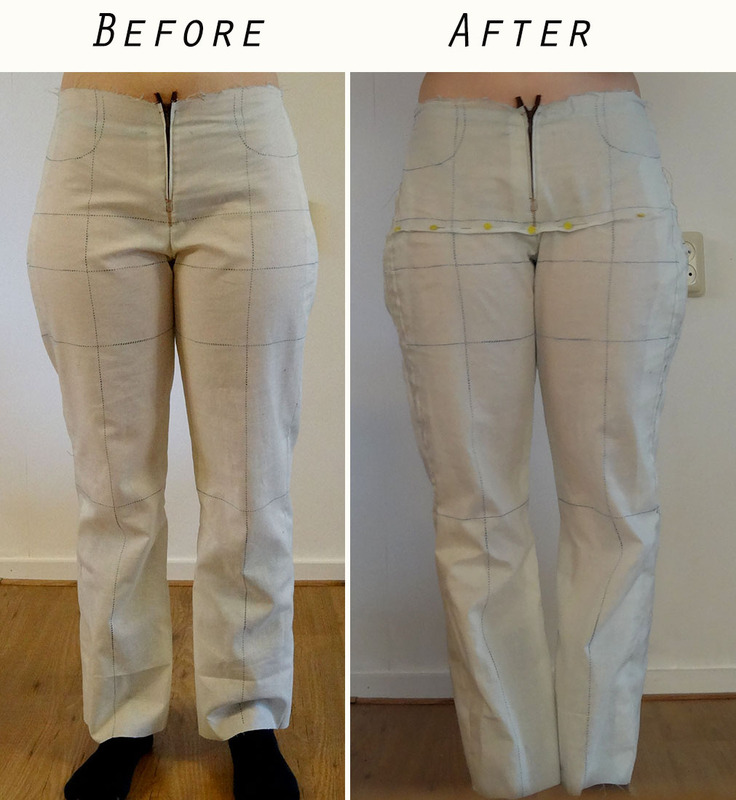 This will speed up the sewing process because I won’t have to stop to test this anymore. I also don’t have to quit in the middle of a sewing frenzy because I forgot to buy a zipper (I have a huge stash of zippers and something is bound to be suitable). Testing these things also makes for a nice change from making muslins. This fabric was distressed before topstitching. It’s also fuzzy. Do you generally make samples before trying something new?